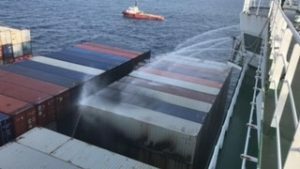 A FIRE in the hold of APL Vancouver erupted in the early hours of 31 January while it was on passage from Shekou to Singapore. On Tuesday, the vessel’s operator, APL, released a statement confirming the vessel was still ablaze, but the situation was “progressing favourably and is under control”, while all crew onboard remain safe. APL said shore support and firefighting tugs had been deployed under the oversight and assistance of a Vietnamese coast guard vessel on sight. “Additional resources, including equipment, external specialised firefighter teams and salvage master have been mobilised,” the APL statement reads. From videos and photographs posted online, the fire seems to be near the ship’s accommodation block. Singapore-flagged APL Vancouver (IMO 9597472) is a 14,000-TEU, 115,060-dwt vessel built 2013.